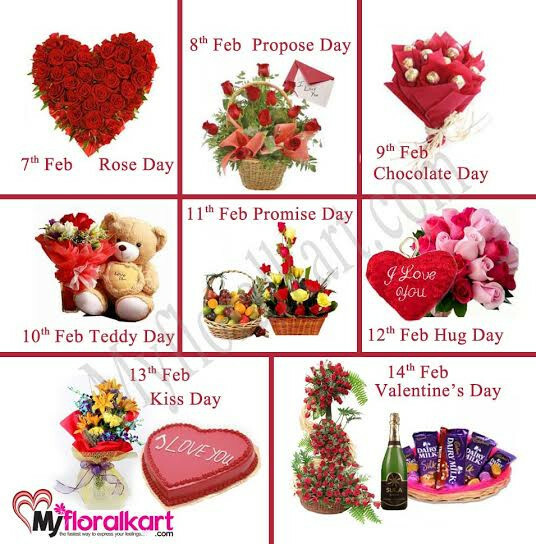 A very Beautiful Valentine week Gift hamper to make Your love feel that he/she is special. 1st day- 40 red roses Heart-shape arrangement. 2nd day- Basket arrangement of Red roses with Valentine love Greeting card. 3rd day- 16pcs Ferrero rocher Arrange in very unique way. 4th day- 1 feet cute teddy with love message and along with red and white roses in Tissue paper packing. 5th day- 3 kg seasonal mix fresh fruit basket with basket arrangement of red and yellow roses. 6th day- Heart cushion with love message and along with pink and red roses bunch. 7th day- Arrangements of Mix flower like lilies , orchid, carnation,roses in a very Royal Style and with 2 pound heart shape cake with your message on it. 8th day- 100 red roses arrangements with sula champagne and along with silk hamper for your love ones.